R.I.P. my Canon 24-105 L series zoom, Welcome…brand new Canon 24-105 1:4L IS USM zoom! This is it. 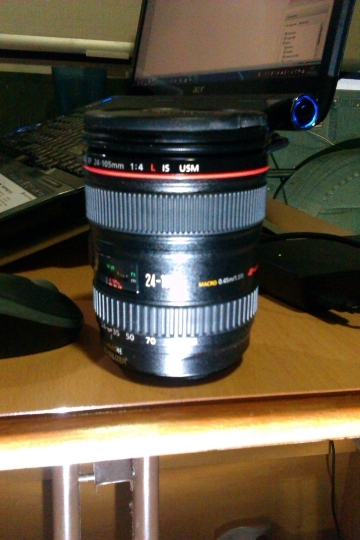 The Canon 24-105 mm 1:4, L series lens with IS and USM. IS is image stabilization, which I tend not to use, and USM is the ultra fast, ultra quiet ring motor that drives the auto focus. Probably the best all round daily lens ever made. It goes wide to 24 mm, zooms out to 105 mm, and has a macro mode where you can focus right down to 9 inches at 105 mm. It’s weatherproof, which is just as well as it got soaked a few months ago on Snowdon. It’s also robust, and has been dropped many times, twice onto concrete from about 4 feet and once onto wood from about 6 feet. I originally got it as a kit lens with my 5D about 5 years ago? Since then I’ve taken about 19,000 images on it on the 5D and the 5D Mk II. It’s been a dependable workhorse and the most used of my lenses. I was walking Jack by the river in Dumfries and it was gloaming and the riverside looked lovely in the light, so I went to take some photos and I could feel the lens juddering like mad as I half pressed the shutter. I tried to take a photo but it locked up and an error message came on the screen saying I needed to clean the contacts. I did that, but each time I tried to take a photo it was the same. I turned auto-focus on, then off again, then turned IS on and off again. I changed shutter speeds and aperture, wiped the contacts of the lens and camera, and also spun the focus barrel in case there was a jam. All sadly to no avail. I got 2 shots in half an hour, there was obviously something wrong. When I got back to the van I googled the error and apparently it’s very common, it’s sheer wear and tear and madly, only a couple of hundred pounds to repair. You might think that’s a lot but for these lenses it’s cheap. I was quoted £450 just for a service last year. Anyway after googling some prices, I found the average new was about £860, the average second hand was about £550. Yet I found a brand new one for only £589 after a lot of searching! I googled the company offering them so cheaply and they seemed ok so I rang them and they said that because they don’t come in a shiny colourful retail box they can charge much less. So I ordered one and within 2 days it arrived in Dumfries Post Office. Oh joy! So the plan is, sell the old one broken for about £200 or have it repaired and sell it for £400. (Already got a buyer if it’s fixed) Then I’ve got £200 off the price of it so a brand new lens for only £389. Cracking or what? Who are these magical people who sold me the lens? Well they’re HDEW Cameras and they’re down in Surrey. They were great on the phone, very knowledgeable and helpful, and for less than a tenner my lens was with me in 2 days. They even pointed out on the phone that they aren’t allowed to send an item anyway other than the billing address if paying by debit card, so instead, as I’m in Scotland touring, they gave me their bank details to do a direct bank transfer. Great service and great price, I’ll definitely be using them again in the future. 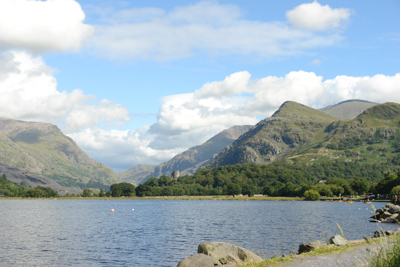 I took this from Llanberis car park, that’s Snowdon in the background. I feel quite attached to the place since I went up, it’s good to have achievements in your life, especially when you work very hard for them. I like it round here, I recall from way back in 1995 when I worked in mental health and I was tenting around the country on days off. That’s why I came back but I never knew then that Snowdon was here or so accessible. I found this amazing view on the way up Snowdon today. 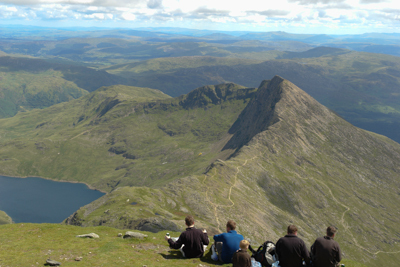 I’ve long wanted to climb Snowdon but due to being a life-long smoker and the way my legs are with sitting for a living, I wasn’t sure if I’d ever do it. 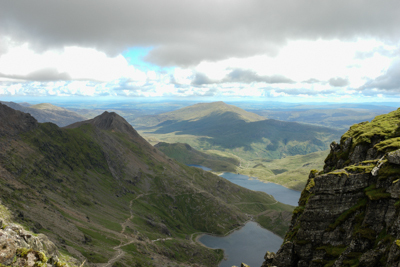 This view is of the Pyg and Miner’s tracks as they converge, looking east from the Llanberis path. This section is a sheer drop and probably one of the biggest I’ve ever seen. This is a view from the summit. I actually can’t believe I got here! 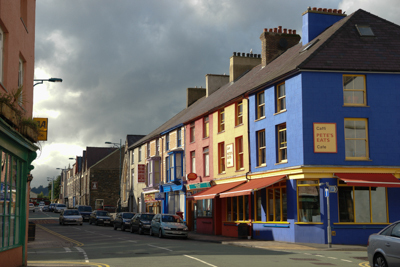 You can see all the way south to Harlech, and north to Anglesey. This is a major achievement for me and I must do it again! The only way I managed it was by walking as much as I could and stopping for a rest. But by the halfway point I was knackered. 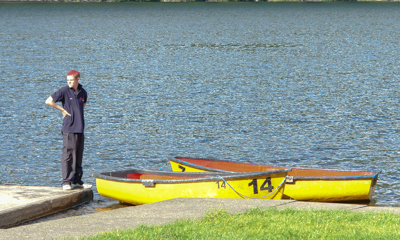 Sometimes I wasn’t going more than 50 yards before stopping again, then resting for 2-3 minutes before starting up. It took a long time to get there but I am so pleased I’ve done it. I climbed Ben Nevis way back in 1995 or something so this is the second highest peak in the UK conquered now. Oh…and my legs are not aching at all! Well I’m having a fantastic time here in Llanberis, it’s a shame that the rig isn’t. It failed to connect yet again and Nick is now not answering his phone most times I call. Barry Lieberman still calls, to ask for his £70 a month connectivity fee. Thank God for the Vodafone USB modem! It was supposed to be a backup but it’s my main form of communication with the internet and work now! So much for Ethnet ‘guaranteeing’ to make things work. The fact that they won’t answer the phone anymore kind of says they’ve given up on it.